In collaboration with Stanford University, the Art Science Research Laboratory is creating a digital archive of the works of Stephen Jay Gould. Professor Gould is regarded as the most widely read scientist of our time. Items in the archive will include the 300 essays Dr. Gould wrote for Natural History magazine, the complete text of two books, a series of 20 lectures videotaped in spring 2002, and the materials from a course taught at Harvard University in spring 2001. 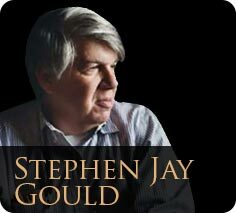 Stephen Jay Gould wrote 300 consecutive essays for Natural History magazine, from January 1974 until January 2001. Spanning twenty-seven years, “This View of Life” became the longest-running continuous series of scientific essays ever written. The essays explore not only the topics of paleontology and evolutionary history, but also cover subjects as diverse as famous literary figures and baseball. The archive will digitize the entire series of essays, complete with source materials. Of the 22 books that Stephen Jay Gould authored in his lifetime, the archive contains the complete text of 2 of these books in its cyberLIBRARY: Ontogeny and Phylogeny (1977) and Time’s Arrow, Time’s Cycle: Myth and Metaphor in the Discovery of Geological Time (1987). Each book retains its original pagination, and the books can be accessed chapter by chapter using links in the table of contents, or read page by page using the page navigator at the top of the screen. In its cyberAUDITORIUM, the archive hosts a series of 20 videotaped classroom lectures, recorded between February 7, 2002, and May 2, 2002, which can be viewed through Real Player. The archive also contains the material for the Harvard University course “B16: History of Earth and Life” (spring 2001), including lab assignments, mid-term and final exams, the complete text of Darwin’s On the Origin of Species, and the text for 28 chapters of B16: The History of Life, a multi-author collection.